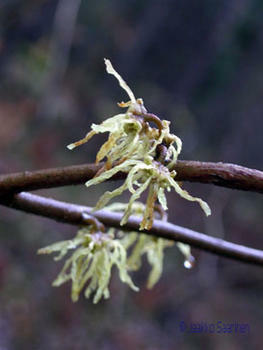 Witch hazels (Hamamelis spp.) are found naturally only in China and North America. Of the various species, the eastern American Hamamelis virginiana, growing in and at the edges of broadleaf forests, is considered the hardiest. This shrub grows to about 2m, with leaves resembling those of the hazelnut (Corylus avellana), and a beautiful pale yellow in autumn. The species flowers late in the autumn. It has small yellow flowers with narrow ribbon-shaped petals, growing in threes in the angles of shoots. About a year after flowering the shiny black seeds are flung explosively from the shiny woody capsules as much as 15m from the bushes. 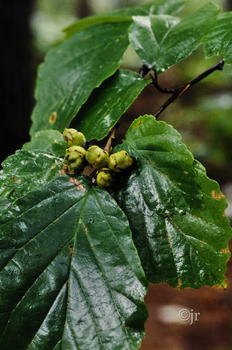 Common witch hazel has long been grown in Finland but remains rare, mainly found in collections. At Mustila the species grows in several places including Alppiruuslaakso (Rhododendron Valley), Etelärinne (Southern slope) and along the stream flowing into Tammimetsä (Oak Forest). They include old and young shrubs from expedition collections of extreme northern provenances. Witch hazel flowers last of all the shrubs at Mustila, usually in November, thriving and flowering even in full shade.